The weather outside might be frightful, but that doesn’t mean that your fashion has to be. Don’t get me wrong, I love an oversize sweater, and big, comfy sweatpants are a gift from the heavens above; but winter fashion, and I’m talking the cozy, hygge, introvert life kind of fashion, doesn’t have to mean frumpy. That’s why it’s time to rebel against the frumpy(ness) of basic winter fashion by amping up your introverted fashionista looks. Celebrate your cozy with a bit of couture so that your personal style can act as a ward against the winter blahs. Fashion isn’t just personal expression, it can also be a tonic that cheers us up, and reminds us that we have self-worth. Need a few ideas to help cheer on your inner winter fashion rebel? Check out our cozy couture looks below! Switch up the look with sequin socks and ankle boots. January is the perfect month to daydream. This Ellazhu t-shirt mini-dress is perfect for reminding yourself to dream dreams and to do so in style. In the first look, we styled it with thigh high sneakers. The second look is styled with ankle boots and sequin socks, clearly, there are no winter doldrums here. Warm your winter fashion style with a bit of steampunk. This oversize dress is perfect for lazing around the house in stylish comfort. Need to get out and about? Add ankle boots and tights, and who doesn’t have goggles lying around the house, for steampunk chic styling and precision perfect comfort. Zara did a thing this past fall. They got all faux furry with it. They embellished sleeves with faux fur. They gave us pockets of faux fur. Fur here, fur there, a little fur everywhere seemed to be the motto. Now I’ve got my own set of pet fur sleeves, and I kind of love them. Who needs a blanket when your clothes act as a surrogate blanket. . . or a pet. Coordinate a winter white look, or just enjoy the old Hollywood glam look by adding a bit of faux fur to your winter styling. It may be winter now, but summer is coming, or you’re just lucky enough to vacation in a tropical clime. 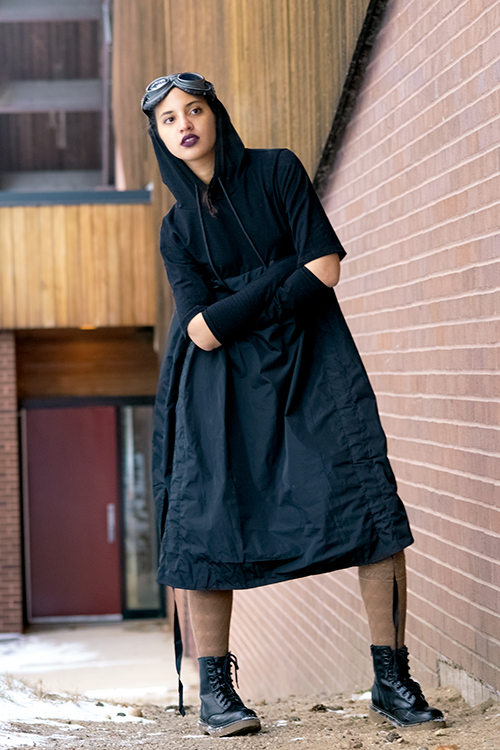 There is nothing more comfortable than a t-shirt, so this t-shirt dress really brings on the comfortable fashion while keeping it “fresh” with a mesh bottom hem. No matter how you get your cozy on, we hope these four looks provide some inspiration for styling your winter fashion for public view, or for amping your cozy couture for your own personal enjoyment.